In non-ground-breaking news, bushy brows are still the eyebrow trend du jour - eight years after Cara Delevingne and her beautifully full brows burst onto the scene. But one model is championing even bushier brows, in an attempt to make the monobrow mainstream. Meet Sophia Hadjipanteli - a Greek-Cypriot model who's not only been blessed with devilish good looks but brows most of us can only dream of growing. The stunning Instagram star is championing the monobrow movement in an attempt to transform the once undesirable feature into the only brow to be seen with, one fire Instagram selfie at a time. 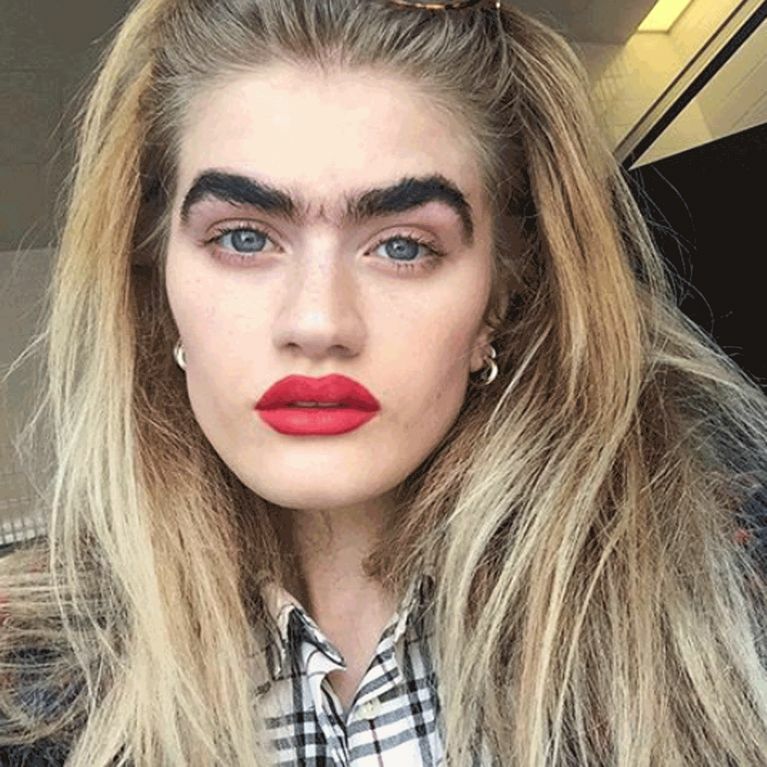 And while there's no doubting the photogenic qualities of Sophia, her prominent unibrow consistently divides the people of Instagram and her 58K followers. A quick scroll of the comments section on her posts will reveal hundreds of heart-emoji outbursts but for every 'OMG I love your brows'-type comment, there's ten keyboard warriors asking her WTF she chooses to have a unibrow, with some even telling her exactly how she should groom her brows. Spoiler: she's a woman of her own agency who's capable of making her own decisions and doesn't need your 'tips'. Here's an example: "Your eybrows would look so much better without the unibrow part just get rid of that part. What's the point? Not attractive." It turns out Sophia couldn't give any less f*cks about what people think about her stand-out facial feature, telling Haper's Bazaar: "I am not really doing this to show people that they have to like [my unibrow], I am more so doing it to show people that they can get on with their lives by having a preference. I personally think my face looks better this way. Others disagree, and that’s totally cool." She insists her aim isn't to persuade people to forgo plucking their brows to achieve a similar look to hers, adding: "If I like this, just let me like this," which proves just how unbothered she is about the trolling comments. If you're wondering how Sophia keeps her brow beautifully bushy then you'll be glad to know it takes a lot less time and effort than filling in two sparse caterpillars every day. Her secret? Good genes and a nightly coat of castor oil.